A: Yes, we ship to anywhere in the United States. We will work with you directly to find the nearest, most cost effective airlines to work with. If the distance is not more than 4 hours away, we will meet you half way to deliver. A: Yes, we will only charge you what the airlines charge us-plus the cost of a crate. A: Yes, your animal will have had a full examination by a veterinarian prior to taking possession along with documentation of first vaccines and de-worming. Your pet will have a guarantee to be free from hip dysplasia. A: Yes, to state that you agree, if registering your pet, the Lakebreeze prefix must be used in your pets registered name and that you read and understand our health guarantee. Q: Are the parents OFA certified? Q: Do the puppies come with "papers"? A: Yes, if puppiess are purchased with breeding rights. 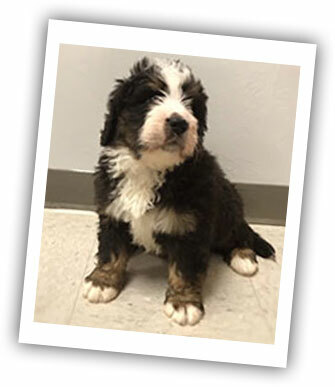 The Bernese Mountain Dogs are registered through AKC (American Kennel Club) - The Ole English Bulldogges are registered through International Olde English Bulldogge Association. Q: How much do the puppies and kittens cost? A: Please call for pricing.